Montana State University School of Art and the Helen E. Copeland Gallery invite the public to the premiere of “Drift, Ascend”, an MFA thesis exhibition by artist and MFA candidate Jessica Mongeon. Mongeon’s thesis exhibition exposes and explores structures that are found in the natural world, as well as the world of imagination. Jessica Mongeon documents her hikes through mountain terrain, aggregating multiple experiences into large-scale India ink and acrylic paintings on paper. By building up calligraphic marks, along with larger strokes of color, she creates a space that speaks to her journeys though the veil of time, distance and action. The exhibition dates are Monday March 4 – Friday March 8, 2013, and it is free and open to the public. 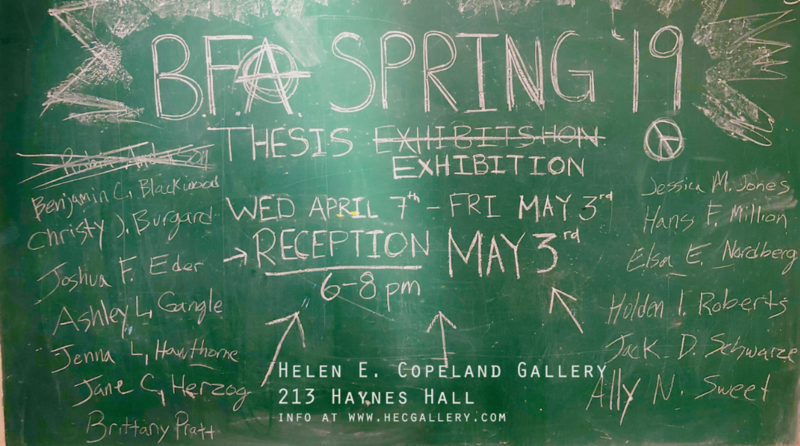 The artist will be presenting her defense of thesis on Monday March 4, 11AM, in the Helen E. Copeland Gallery. There will be an artist’s reception on Thursday March 7 from 6:30 – 8:30 PM. The Helen E. Copeland Gallery is located within The School of Art’s Haynes Hall, on the second floor and is open Monday through Friday, 9:00AM – 5:00PM.